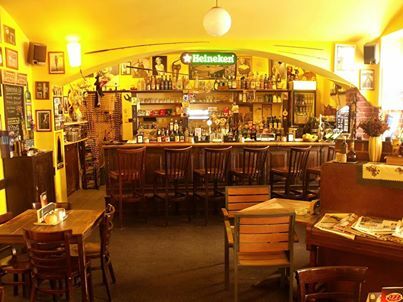 Ever since 1999 the Café & Bar LOCÁL has offered cosy room to sit down in a pleasant atmosphere enriched by unobtrusive sounds of music covering a variety of genres (such as Oldies, Jazz, Swing, Rock and Roll, Latino, Bossa Nova, etc.) You may rest assured you will not be subjected to the cheap din of the standard commercial radio stations. The patrons can select whether to sit in a more lively area or in a separate and quieter private room that is also occasionally used as a small exhibition gallery. From May to September sitting is also available in the front garden (from noon until 10 pm on weekdays and from 4 pm until 10 pm on weekends). We offer our guests the excellent Sicilian brand of coffee MOAK, quality Twinings, Mesna and Dilmah teas and also hot beverages based on mint and ginger. When it comes to tapped beers, we offer Heineken, Hoegaarden and Leffe brands, and as far as wines are concerned, we serve the products of SALETA Višňové and PATRIA Kobylí wineries. There is also a wide choice of alcoholic and soft drinks ready to serve. We will gladly prepare for you various mixed drinks, both the soft ones and the alcoholic ones (more than 10 different kinds of fruit juices from the Rauch Co. and several kinds of home-made sodas). If you feel like having a snack, you can choose from among several kinds of salads, toasts, Italian pizzas and, last but not least, our home-made marinated Camembert cheese. Subject to a prior agreement you may use the facility for arranging various special occasions like get-together parties, birthday celebrations, corporate parties, alumni reunions, various presentation events, etc. The back room in the Café & Bar LOCÁL can be also used, subject to prior agreement, as a paintings or photography exhibition area. Details concerning arrangement of any such event will be given to you by the bar staff.